Yoga is becoming an increasingly popular form of exercise and there has been a lot of buzz about its health benefits – both mental and physical. Some people even claim that it has changed their life. But is yoga really all that? Are the benefits as good as they seem? And should you consider introducing workplace yoga as a way to help your employees with their physical and mental health? In this article, we explore some of the key benefits of workplace yoga. We also outline some things that you need to take into account before deciding that yoga is the solution to all of your workplace problems. One of the main things that yoga teaches, alongside the more physical aspects, is mindfulness. This is why breathing is at the core of most yoga practices. Those practising yoga in the workplace are asked to clear their mind from busy thoughts and focus purely on the moment. An increase in mindfulness among your employees can help prevent them from becoming overwhelmed in stressful situations. It may also increase focus and productivity on a daily basis. Another well-documented benefit of yoga is the positive effect it has on your physical health. Since office jobs are mainly sedentary, employees aren’t as able to get up and stretch during the day and will frequently develop bad posture. 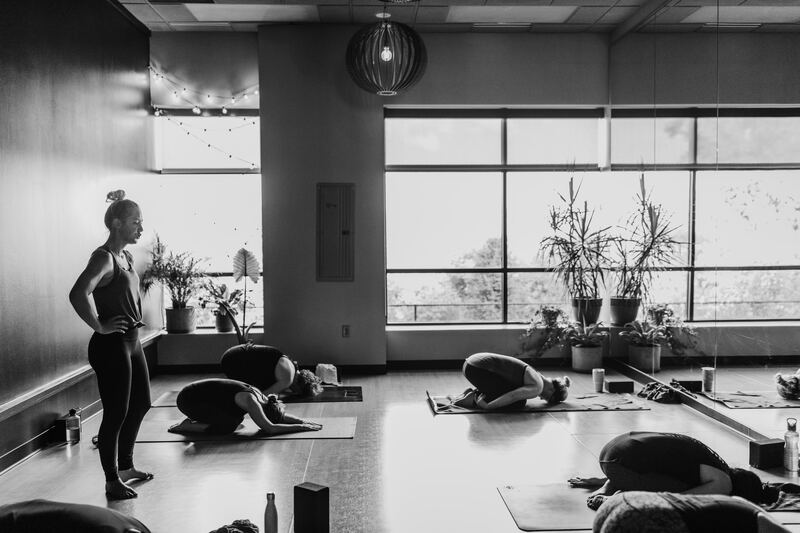 Workplace yoga can help improve posture, reduce pain in the back and other areas, and incorporate some gentle exercise into the routine of your employees. A key example is lower back soreness, with studies suggesting that regular yoga sessions can help to significantly reduce this. Alongside physical health, yoga is also known to be really beneficial for mental health. Work-related stress is on the increase, and while yoga cannot provide all the answers to our work culture, it does provide an outlet for stress and a coping mechanism for those with busy lives. Taking some time to focus on yourself and indulge in self-care through workplace yoga may help your employees to feel more relaxed and confident in their abilities. The danger with workplace yoga is that it will become a gimmick – something that is introduced as just a bit of fun but not taken seriously. If you really are looking to improve the physical and mental wellbeing of your employees, make sure it is available in the long term, rather just as a fun thing for a few months. You should also ensure it’s run by a professional so that you’re getting proper lessons and not risking any injuries. On a similar note, while workplace yoga can have really great benefits for physical and mental health, this may be pointless if your employees don’t realise this or don’t engage with it properly. It would be far more useful to explain the health benefits to your employees so that they are educated and can make an informed choice about whether yoga will enhance their working experience. Although yoga is a good perk to have in the office, it doesn’t make up for a negative working culture. Providing yoga is all well and good, but you shouldn’t use this as an excuse for ignoring the needs of your employees. If you recognise that there is a bigger problem at hand, you need to provide real support and get to the root of the problems. Don’t avoid engaging with your employees, real support for wellbeing requires you to be involved and make sure that people are able to discuss their emotions at work. Keep an eye on the blog for more articles about wellbeing in the workplace and feel free to get in touch with us if you have any questions.